No one wants to wait on the phone. That’s why we tuned everything for spectacular speed – from the slick code base to optimization of all media files. Your users get your valuable pages in the language their phone is set to. No rubbish information, no painful language switchers. 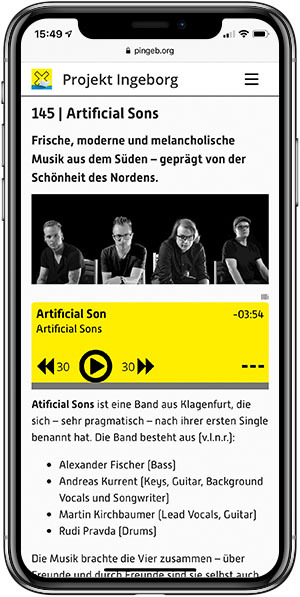 Provide an audio guide, show your latest videos or offer maps with navigation. 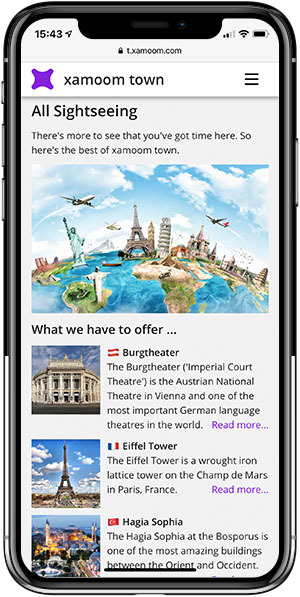 Offer every content form that can be displayed on a phone’s browser. 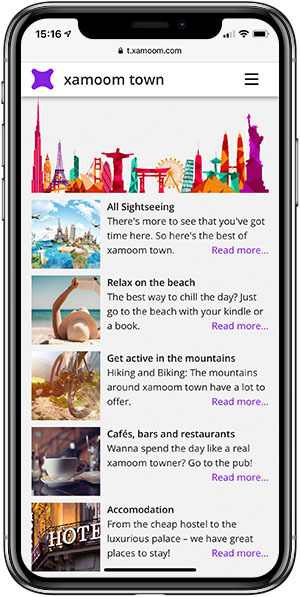 xamoom bridges the real world with the smartphone. Users can easily make discoveries what’s around them and be guided to that location. xamoom is a proven solution. That means that it is available today for a calculable cost. You do not have to carry any development risk and worry about missed deadlines. You should do more important stuff than running and updating software on servers. xamoom’s engineers develop, run and maintain your complete mobile solution. We have not yet hung up on any of our customers and take care of problems for as long as it takes. This is also true before a sale where we offer consulting for free. There are not additional charges for hosting it under your domain. You simply tell your ISP to change a few DNS records and we’ll take care of the rest. The network traffic from the complete site is encrypted and we take great effort to secure the whole platform with state of the art technology and methods. You have also an app? Great. 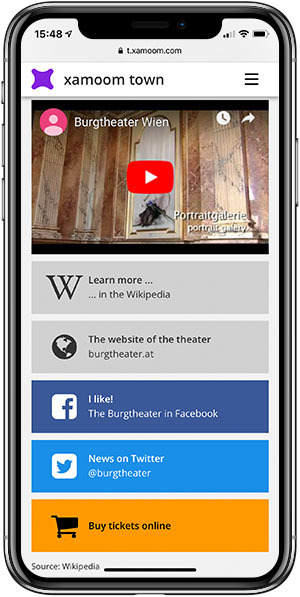 The mobile web is the perfect entry point and it does inform your users about the availability of an app that is only one tap away from being installed. You can advertise your mobile information system using QR codes, NFC tags and the menu offers a “nearby”-Link that triggers a GPS-query of what’s close to discover. One more thing: We do believe in content ownership. Your content is yours and yours only. We will never try to monetize it in any other way than to display it to your users. At the end of our partnership you will get a machine-readable copy of it. The mobile web is hosted under your own domain. It shows a lot of information but can also be tailored to your current priorities. We built in lots of shortcuts with lists, maps, links and includes. Prior to xamoom the founders had 20+ years of working in media and we know that efficiency is key to a CMS. We know what makes mobile great. Lots of features are tweaked for great usability on the phone – from clever email integration to finger-friendly links. Thanks to CSS and our intuitive code-editor, web designers can change the look and feel of the mobile web to match your corporate design.